Summertime and the fishin' ain't easy! The start of May marks the official start of Summer. Many rivers have been at summer lows for some time with no rainfall forecast for the foreseeable future. In these conditions the range of tactics we can employ to catch wild trout is effectively reduced. I often describe a brown trout as an aquatic leopard and it isn’t just the spots I’m referring to! In behavioural terms leopards are extremely elusive and can be around people unnoticed. I’ll never forget watching a pool with 7 rising trout about 30 feet above the river. A skilled fly fisher arrived with great stealth. As soon as he started to wave a fly rod, every one of those trout vanished out of sight in typical leopard like fashion. Is this the same shy elusive brown trout that just covered 20 feet of river in under a second to hit that streamer as I was about to lift it at my feet? Yes that vicious savage predator that will attack almost anything it “thinks” is smaller than it. 6 inch browns will hit 6 inch streamer flies. Yes the leopard like the brown trout is widely known as a predator. An elusive, shy aggressive predator? It almost sounds like an oxymoron but in both the case of the leopard and the brown trout this is an accurate description. In conditions like these it helps us if we understand the leopard like characteristics of the brown trout if we want to examine one of these magnificent fish close hand in our landing net. When the rivers are low the habitat wild trout are comfortable in (i.e. that which offers protection from predation and a supply of oxygen and food) becomes limited. Invasive techniques like Czech nymphing become less effective because the fly fisher has no disguise in these conditions and blind nymphing in crystal clear low rivers like the ones we are experiencing is rarely effective except in deep fast pockets. We need to maximise techniques that increase distance/stealth between us and our target for example upstream dry fly. When the river is low the elusive leopard like nature of the brown trout will come to the fore. Pressure waves caused by wading can be sensed by trout even out of casting range. In these conditions the odds are heavily stacked against the fly fisher and in favour of the fish. Casting a dry fly upstream into the fastest deepest sections of the pool will often still pay dividends. The soft hackle dry fly is my go to for this but in low conditions black gnats and black midges and a whole range of black terrestrial merde become a mainstay for many feeding fish.Have a few Griffiths gnats in several sizes and this will cover most low river situations when fish often rise to an eclectic mix of stuff. And leave the 5 weight fly rods in the car. 3 weights, double taper lines, furled leaders and 6X and 7X tippets are the order of the day for targeting rising fish in low clear rivers. A successful small stream technique for presenting a nymph is the duo or Klink and dink. The Klinkhammer is not my preferred fly for this technique and I prefer the buoyant Onstream-guide Lifejacket Elk hair flies. 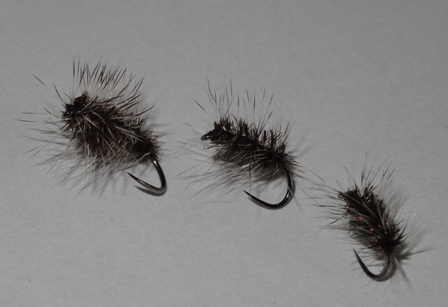 These bespoke flies will float long and high even after taking fish which they do with regularity. Their main purpose is however is to act as an indicator. 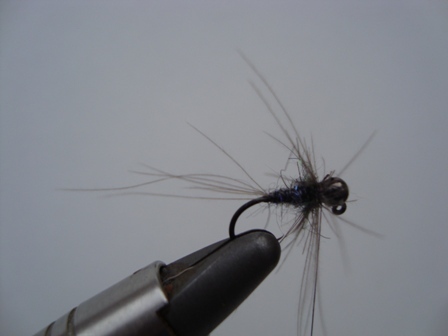 In low clear conditions the black magic nymph in size16, a modern version of the great WC Stewarts black Spider comes into its own. It does a passable imitation of not only aquatic nymphs but a lot of the drowned terrestrials that become part of the trout’s diet in low summer conditions. 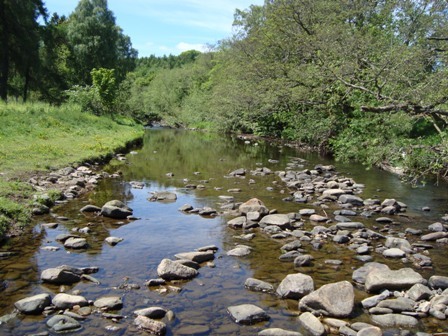 And in these conditions when many of our beloved Pennine rivers are in fact small streams a black magic presented under a Lifejacket caddis will work. A tip is to strip some of the hackles of the black magic nymph away to produce a more perdigone stripped back style of nymph when conditions get really tough. 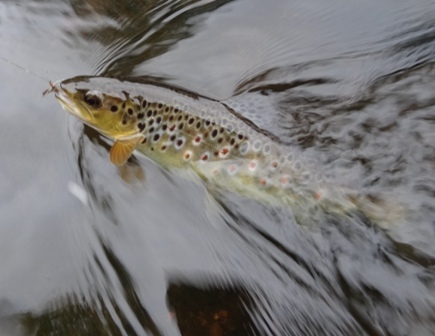 The brown trout is the ultimate opportunist and despite of or in spite of the conditions his leopard like predatory characteristics are still active. I describe fishing a lure or streamer for brown trout as the “martini” technique. Any place, anywhere anytime as the old 70’s advertisement stated without irony for promoting alcoholism. Well those few deep holes with water barely flowing through them? Well try a dry but chances are it will be ignored. But a streamer or lure like a wooley bugger is often grabbed with aggression when twitched enticingly in front of fish. I do not promote fishing streamers or lures down and across but rather an active technique used to seek out fish. It can even be fished upstream. The streamer can be a lure and black motile materials with tungsten beaded heads will bring results. Bring out the leopard in the wild river brown trout.